In August of 1951, a strange epidemic struck the sleepy little town of Pont-Saint-Esprit in France. Over the course of a single day, hundreds of people lost their minds. A little boy tried to strangle his grandmother. A man realized he was an airplane then jumped out a window and broke his legs. Another man tried to drown himself to destroy the snakes that were eating him from inside. Within hours, the nearest asylum was overflowing with lunatics — men, women, children, all of them gripped by some strange madness, shrieking, laughing, gibbering, weeping hysterically. They cried that they were being tormented by demons, they were burning alive, their brains had turned to lead, they were sprouting flowers from their stomachs. It wasn’t long before the asylum ran out of straitjackets. Most of the victims eventually recovered their sanity, but not before five people had died. The culprit behind the bizarre events in Pont-Saint-Esprit was a fungus called ergot that can grow on rye. The fungus produces a highly toxic brew of hallucinogens with very unpleasant effects; the most important of them is called ergotamine. Ergot poisoning is called ergotism, and improvements in agriculture have made it rare in modern times. Back in the Middle Ages when ergotism was more common, however, it was known as St. Anthony’s Fire, and often it was blamed on witchcraft (like anything else medieval priests couldn’t explain). But the importance of ergot goes far beyond medieval witch trials. For ergotamine can be hydrolyzed or broken down to yield a compound called lysergic acid. 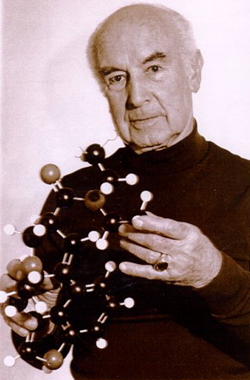 And in the late 1930s, Swiss chemist Albert Hofmann chemically modified this compound to make lysergic acid diethylamide or LSD. Just like the compounds in the ergot fungus, LSD is an extremely potent hallucinogen, but the similarities end there. Unlike ergotamine, it has relatively low toxicity. Moreover, unlike all the other drugs we’ve looked at so far (heroin, meth, coke) it’s non-addictive. The chemistry of LSD is fascinating and complex. In this post and the next I’ll look at just a few cool facts about LSD: what happens when you put it under a black light and what happens to it inside your body. Why do things have color? It seems like a simple question, but it actually turns out to be very complicated. If an object absorbs some frequencies of visible light and reflects/transmits others, it appears colored, because your eyes can tell the difference between various frequencies of visible light. But what is it about the structure of a molecule that makes it absorb visible light? Colored molecules usually contain one of two specific features. 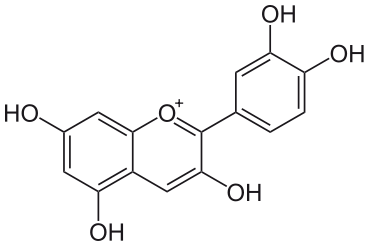 Look at the structures of the six molecules below: eumelanin, a pigment in human skin (more eumelanin = darker skin color); heme, found in hemoglobin(makes blood look red); sodium ferrocyanide, which is yellow; beta-carotene, the pigment that makes carrots orange; cyanidin, a pigment in berries that makes them purple-red; and lutein, which makes egg yolks yellow. Four of them share one thing in common, while the other two are alike in a different way. 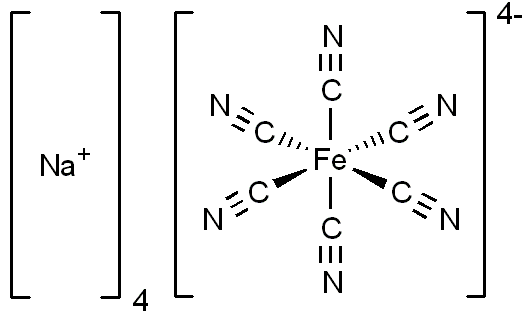 The two at the top, sodium ferrocyanide and heme, contain a transition metal ion like iron with other nonmetallic compounds bound to it. This type of molecule is called a coordination complex. All of the others contain networks of alternating single and double bonds. These are called conjugated systems. Brightly colored organic (carbon-based) compounds typically contain either a metal complex (like heme) or an extensive conjugated system (like cyanidin). Organic molecules that lack these features are usually colorless. The reasons why this is true have to do with some more complicated chemistry. I want to keep this simple, though, so I’m going to skip all the gory details and just point out a couple things that will bring us back to LSD. The world of atoms and molecules is a strange one in many ways. When you throw a baseball, you can throw it as hard or as soft as you want, give it any amount of energy you choose. But an atom or a molecule isn’t like that. It can only have certain specific amounts of energy, just like how you can be on the second or the third floor of a building but not on the 2.25th floor — there is no such place. So a photon of visible light will be absorbed by a molecule if and only if the energy that photon has is equal to the difference between the energy level the molecule now occupies (its “ground” state) and another energy level it could occupy (an “excited” state). What happens to that absorbed energy? Typically it’s lost as heat (random motion of molecules*). Some compounds, however, lose some energy then re-radiate the remaining energy. Since some of the energy was lost, the compound absorbs photons at one frequency and re-emits photons at another lower frequency. Often, for example, these compounds absorb high-frequency UV light then re-emit low frequency visible light. When you put them under a black light they start to glow. In other words, they’re fluorescent. The conjugated system here isn’t extensive enough for LSD to absorb in the visible range, and so LSD is a colorless compound. But it does absorb pretty well at some lower frequencies in the UV range. And its structure is such that LSD is fluorescent. When you put it under a black light, it glows. *Technically heat is defined as transfer of energy from one system to another, and this is important in thermodynamics, where heat has a very specific definition. But in everyday English we use heat like “the metal pan is hot”, and that’s the way I’m using it here. Imagine for a minute that you’ve been enrolled in an experiment. We’re going to give you a carefully-measured dose of LSD then take blood samples at periodic intervals to see how the concentration in your bloodstream changes over time. What we’ll end up with is a so-called PK curve, a graph displaying concentration as a function of time. 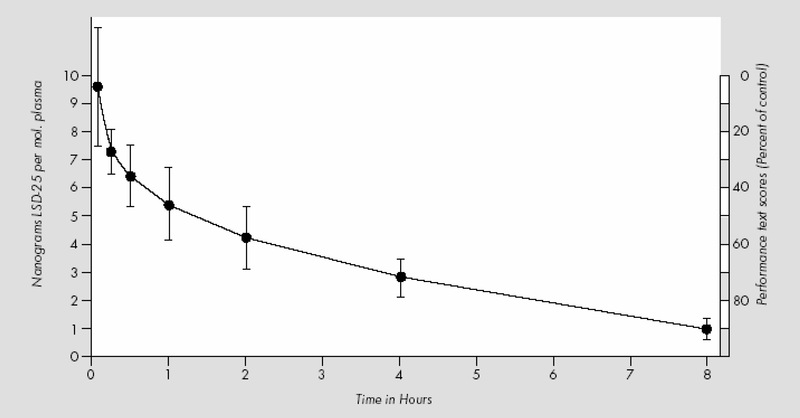 The graph below is from a study where human volunteers were injected with 2 micrograms of LSD per kilogram of body weight. Now this is with LSD injected directly into the bloodstream, so the concentration is at a max at time t=0. If you’re taking LSD on blotter paper, of course, the drug takes longer to reach the bloodstream (it has to get absorbed into your system first), so concentration will rise to reach a peak rather than starting out at max. Either way, however, your liver will gradually convert the LSD into other compounds or metabolize it, and your kidneys will remove both LSD and the metabolites from your bloodstream. So extensively is LSD metabolized that less than 1% of the original compound shows up in your urine in its intact form. The half-life is the amount of time it takes concentrations to fall by 1/2. Clearly LSD has a much longer half-life than cocaine, which breaks down very rapidly in your system. But its half life is also much shorter than the marijuana-derived compound THC. And it matters because the length of time it hangs around helps determine the length and intensity of the drug’s effects. To make matters more complicated, LSD is an extraordinarily potent drug. The doses you need are measured in micrograms or millionths of a gram. These are miniscule compared to the doses of most other drugs you take — think aspirin, for example. Even very low doses produce an extraordinary effect. Why? Let’s imagine some LSD molecules floating around in solution together with some serotonin receptors. (Serotonin receptors are a particular class of proteins that act as receptors for serotonin, a neurotransmitter in your brain). At any given time, some of the LSD molecules are binding to receptors, and some other LSD molecules that are already bound to receptors are coming unstuck and floating back off into solution. If we give it enough time, we’ll eventually reach an equilibrium where the rate at which LSD molecules are binding equals the rate at which they are coming loose. The tighter LSD binds to the receptor, the less LSD will be left floating around in the solution. In the brain, there are only a relatively small number of neurons that produce serotonin — the number is measured in the thousands. Each of these, however, is connected to many thousands of other neurons in different regions of the brain, so screwing around with serotonin receptors can clearly have far-reaching impact. How exactly this causes the bizarre hallucinations you get when you trip out on LSD is not yet fully understood. For more on the pharmacology of LSD, see http://www.maps.org/research/cluster/psilo-lsd/cns-neuroscience+therapeutics_2008-passie.pdf, which is not behind a paywall. This entry was posted in Biochemistry, Chemistry and tagged acid, biochemistry, chemistry, color, drugs, hallucinogens, lsd, psychedelics, science by puffthemutantdragon. Bookmark the permalink. I’d say the illegality of LSD actually makes most drugs; While on it you have a very good chance of hurting someone. Sure, most drugs you’ve got a good chance of hurting yourself, but hallucinogens? Imagine something as simple as running into a road; Someone swerves to avoid you, hit someone else. Next thing you know you’ve got a multicar pileup and a lot of people dead. I can see arguments for legalizing some drugs, but LSD? That one seems kinda obvious. 19 where I live actually. While it is easy to hurt yourself by over consumption I don’t know of many cases where people hurt others when not behind the wheel (Which *is* illegal). It is a good point though; another one is should tobacco be legal due to second hand smoke, and the additional costs to Canada’s health care system. You have clearly never used LSD. Attempting to talk about an issue you are ignorant of makes your words meaningless. Anecdotal evidence isn’t evidence. Just because you were fine on it, doesn’t mean a significant number of people would be. Have there been any published studies on its effects? I understood the CIA studied it heavily in the 70s, but I don’t know how much of their work was me scientifically sound, and of that how much has been released to the public. Yeah buddy, you watch too much hollywood. You have no clue what you are talking about. bro…i sold it, studied it, did it ALOT… i had many people under me sell it… i created a loyal and growing drug empire that spanned across all of southern california, from los angeles to inland empire, all the way south to san diego and i was about to manufacture gallons of LSD….i know ALL about it….and when you people come out of the shadows of the hippies and start to live life like it was, before the 1960’s, only then will you understand pandora’s box should’ve never been opened…I lived for drugs for years…and then spent the following decades condemning them…You people will never know innocence ever again…ALL usage of street drugs will take that away. So please STOP being used by super natural deception !!! Ergot, as seen in the X-files episode ‘Never Again’ in which Scully’s fancyman thinks his tattoo is talking to him and goes a bit crazy, trying to murder her amongst other things. Turns out there were traces of ergot in the red ink used for the tattoo… Interesting post thanks! Interesting as always. Where do you get your sources though? They seem so full of information, I can almost never find stuff like this, maybe I just don’t know what to look for. Here are some places where you can go to look for info on stuff. 1) PubMed (http://www.ncbi.nlm.nih.gov/pubmed/). You can get tons and tons of info here — usually more than you need or want, so you have to be a little bit clever about what search terms you use, otherwise you get seventy zillion papers and you don’t have time to read all those. You can also search just for reviews. That’s kind of handy because reviews will just give you a broad overview of a subject, although you have to remember that the authors of the review may be biased and are certainly not infalliable, so their review is only as good as the papers they pick for their sources. It’s just like anything else — read critically and don’t automatically assume everything you read is gospel truth. A lot of the sources I link to are reviews. A lot of the papers you’ll find on PubMed are behind paywalls unfortunately, so they aren’t usually accessible to members of the general public. If you live near a college library, you can access a lot of papers that are behind paywalls by using the library computers (most big universities/colleges have subscriptions to most of the major journals). You can also try taking the name of the publication you want and entering it into Google then searching for it. Sometimes the authors of a paper will post a PDF of it somewhere (on their website at their university or whatever, for example) and then you can get it that way. 3) Wikipedia is not reliable but it can be a good place to look for papers, because Wikpedia articles nearly always cite their sources, so if you just skip the rest of the article and scroll down to the bottom, you’ll find a list of papers & sources that may be useful. Now you have to be careful there too, because the authors of the Wikpedia article might have selected certain sources for a reason, in which case you are only getting part of the picture, but this can be a good place to start. Also I borrow chemical structures from Wikpedia a lot ’cause it’s faster than drawing my own and their structures are usually pretty reliable (PubChem has structures too). 4) The mainstream media is usually reliable enough if you are looking for a human interest story, like what happened in Pont Saint Esprit, for example. I used Google News to find a Telegraph and BBC article about Pont Saint Esprit. I don’t use the mainstream media to look up info on any science-related stuff (pharmacology of LSD, for example), though, because they never have enough info and are not very reliable. But for human interest stuff they are great. 5) American Chemical Society (http://portal.acs.org/portal/acs/corg/content). You can use the ACS website to search for all kinds of published chemistry-related research. Same caveats apply as when using pubmed (be careful what search terms you use or you’ll get more stuff than you prolly have time to read, also you’ll run into paywalls). So hope at least some of those are helpful. If you are looking for things related to one molecule, Scifinder is excellent. It needs an account, but most universities have a number of floating licenses you can access if you are a student or employee. As a note, if you are looking through papers, you can get most of those through libraries even if you aren’t a student; a number of libraries still keep hardcopy archives of papers, though not recent ones. So you can just drop in and photocopy them, or read them there. Not a prefect solution, but even today not everything is online, so I’ve done it in past. Yes! gracias. scifinder is great also so try that too if you can get in. the nice thing about pubmed and pubchem though is that you don’t need an account to access — can use from your home computer if you like. Thanks for the information. I like the idea of using wikipedia’s sources, I think that will make it a bit easier to get an idea of what I’m looking for and help with finding more articles on a similar subject. So, yeah, thanks.